Abu Dhabi 13 June 2018: Etisalat today announced the launch of the Middle East’s first Apple Watch Series 3 (GPS +Cellular), with smart pay offers that are loaded with benefits. 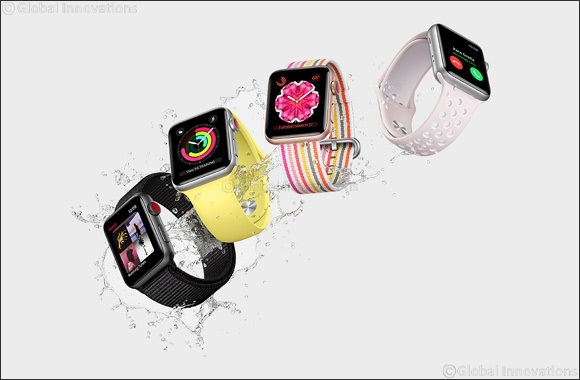 Apple Watch Series 3 comes in two models, one with GPS and cellular, and one with GPS, both featuring a 70 percent faster dual-core processor and new wireless chip. Etisalat is the first UAE operator in the region to offer the eSIM function over Apple Watch cellular. For customers to enjoy the cellular capability on the new watch, they need to pay AED25 per month to enable the eSIM on their Apple watches. An eSIM is a SIM card embedded in the mobile device and will come in the form of an integrated SIM chip that does not need to be removed from the device. Etisalat post-paid customers will be able to purchase the Apple Watch Series 3 with flexible Smart Pay plans on a 12, 18, or 24 month contact. Apple provides two sizing options for the Apple Watch: 38mm and 42mm. Customers opting for a 24 month smart pay plan can purchase the Apple Watch Series 3 (38mm) for AED 70, or the Apple Watch Series (42mm) for AED75, each month. The standalone offer for the 38mm watch is AED1,599, while the 42mm one is priced at AED1,699. Prices do not include 5% VAT. Khaled El Khouly, Chief Consumer Officer, Etisalat, said: “With Etisalat, customers can enjoy the freedom of cellular with the Apple Watch Series 3. A cellular watch could be an interesting option for fitness buffs who can now take a call when they’re out on the water, or go for a run while leaving their iPhone behind. It should also cater to just about anyone who would prefer wearing a mere standalone device on their wrist. Apple Watch Series 3 (GPS +Cellular) adds built-in cellular to the world’s number one watch. With cellular, customers can go with just their Apple Watch and stay connected to the people and information they care about. To help Apple Watch Series 3 (GPS + Cellular) customers get started, Etisalat will also offer a special introductory cellular trial. As a launch promotion, Etisalat customers will get a free subscription for the first 3 months for the cellular capability. Customers can purchase the watch from Etisalat Point of Sale (POS) or online, and can activate the cellular function via Etisalat POS or using his iPhone and watch.